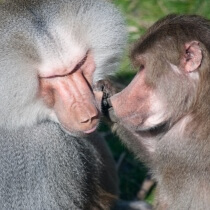 AAP Almere is an animal shelter based in The Netherlands, for apes which were rescued by the AAP foundation. Here in the forests of the city estate De Kemphaan, apes are given shelter. They were rescued from illegal trafficking, were abused or kept as domestic pet. To offer them a better life, the apes are brought to various animal shelters where they gradually are prepared to be released back into the wild. At De Kemphaan you can see these apes. So come quickly to the animal shelter and have a look. The apes brought to the AAP foundation first are brought to a temporary animal shelter. And that is a centre hosting various mammals. Here the apes and the other exotic mammals get a chance to recover and relax from all the abuse they had to endure. The AAP foundation runs its Dutch animal centre on the premises of De Kemphaan since 1996. Goal is to release the animals back into the wild as soon as possible. It is important that they get back to their conspecifics and to their natural habitat. In some cases the animals were kept captive and deprived of their natural environment for a longer time. Such animals need intensive rehabilitation. With the animal shelters the AAP foundation ensures that the apes first can calmly get used again to living in their natural environment together with their conspecifics. 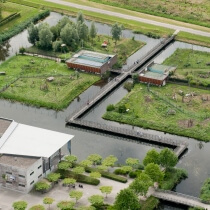 The animal shelter of the AAP Almere foundation consists of several building blocks, hosted on a total area of 5,5 hectare (13 acres). It comprises the ape islands, the quarantine section, the chimpanzee complex, the mammal section and the ape house. Each complex of buildings has its special function. Regarding staff the foundation works with a bigger number of paid employees plus many volunteers. All dedicated to work for the well-being of the animals. The animal centre at any time hosts between 400 and 450 animals. Species vary from the Pallas squirrel and prairie dogs to hamadryas baboons and chimpanzees. Got curious about the animals and how the work looks like at the shelter? Then visit the centre and participate in a guided tour. These are offered by keepers of the AAP foundation each Friday, Saturday and Sunday. You can book your place via phone or e-mail. The city estate De Kemphaan features two ape islands where the apes can play outside. This is part of their recovery programme. Here they get all the space and liberty to play and frolic around with their conspecifics. 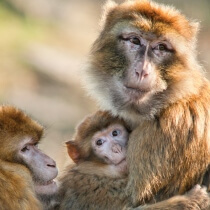 On the islands you find, among others, hamadryas baboons, green baboons and the Barbary macaque. On most days, the apes will be outside from 9.30 am to 4 pm. Visiting the islands is always free of charge. The AAP Almere foundation gives shelter to animals which were neglected, not only in terms of being looked after but also regarding their social environment. For every animal an individual caring plan is made. Goal of that plan is to let the animals return into the wild as soon as possible. So each of the animals is treated appropriately and its individual perspectives for the future are examined. For the chimpanzee building complex this means that the chimpanzees get the chance to live together with their conspecifics there. Intention behind this is to facilitate their return into their natural habitat later on. It you want to visit the apes and concurrently, learn more about the shelter and how they live here, you can book a guided tour. That tour, lead by the keepers working at the shelter, will guide you through all the building complexes of the AAP Almere foundation. It is a good opportunity to get some insight into the daily work at the centre. You’ll see for yourself what the foundation does for the rescued animals. Book your place via our website or contact us directly. Find here below a scheme of the building complexes of the AAP foundation. That scheme clearly shows that each building complex has its own specific function. The ape islands and the canteen are freely accessible. It you want to see the other building complexes you can book a guided tour. Interested in this so called ‘rondje AAP’, the ‘little ape round’? Then book your place now!